The inaugural London Mexfest launches this summer, taking place from 17 – 19 August at Rich Mix, East London as part of the Shoreditch Fringe Festival. It will present a three day fiesta of live music, contemporary, award winning films including features, documentaries, sci- fi classics, shorts and animations, alongside exhibitions, food – and wrestling! It’s time to turn up the heat and bask in Mexico’s finest cultural gems, without leaving London! The jam-packed cultural event kicks off on Friday 17th with the world premiere Made in Mexico (Hecho en Mexico), a kaleidoscopic portrait of the music of Mexico, its people and their way of life, by UK filmmaker Duncan Bridgeman (Dir. One Giant Leap), followed by a live concert from Amandititita, the Mexican queen of Anarcumbia, an urban blend of rock, reggae, rap, and traditional Mexican cumbia. The festival closes with a screening of Daniel and Ana (Daniel y Ana), which follows the kidnapping of a brother and sister and is the first feature from acclaimed director Michel Franco (his second feature, After Lucia, won this year’s Un Certain Regard prize at Cannes). • Mexfest takes a special look at Sci-Fi classics from Mexico. These Lofi gems, which were enormously popular in the 50s and 60s, have garnered a huge fan base that includes Tarantino and Del Toro. 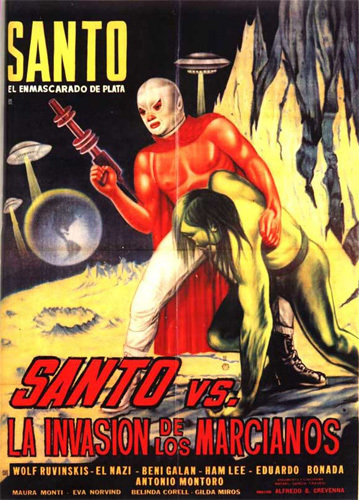 Highlights include a masked wrestler repelling an invasion from Mars in aptly titled, Santo vs. the Martian Invasion (Santo el enmascarado de plata vs. la invasion de los marcianos), The Aztec Mummy vs the Human Robot (La momia Azteca contra el robot humano) and Venusian babes falling for a charro from Chihuahua in The Ship of Monsters (La nave de los monstruous). • Feature film highlights include two films by recent director of Miss Bala, Gerardo Naranjo, I’m Gonna Explode (Voy a explotar), which follows two rebellious teenagers and Drama/Mex, which follows two interlaced stories over the course of one day; We are what we are, (Somos lo que hay) directed by Jorge Michel Grau, a family of cannibals quest for flesh and Déficit directed by Gael Garcia Bernal, following a day in the life of a high-class snob. • Documentary film highlights include award-winning The tiniest place (El lugar más pequeño), by Tatiana Huezo, which follows the struggle of five families to rebuilt their lives in the middle of war, Draught (Cuates de Australia) by acclaimed director Everardo González, captures the exodus, the resistance and survival strategies of a community facing climatic adversity and a myriad of social problems. • Short film highlights include Carlos Cuarón’s The Second Bakery Attack starring Kirsten Dunst and Elisa Miller’s Watching it rain, winner of the Palm D’Or at Cannes and two programmes of vibrant, short animations including the Best Animated Short at Morelia International Film Festival, Black Doll (Prita Noire). endless comic books and films charting their legendary exploits… This weird world is brought to life through an exhibition of sixteen photographs. See the Rich Mix website (www.richmix.org.uk) for the full line up from 24th July.